Oh, yeah, here's a winner: Wow, what a legendary piece of garbage. Twenty years after the fact, it's hard to believe that someone would spend the time to produce this card. And it's harder to believe that this card probably made that scab at least a few thousand dollars. It's not just the crude illustration by fourth-grader lil' Eddy David. Well, actually, that's a big part of it. 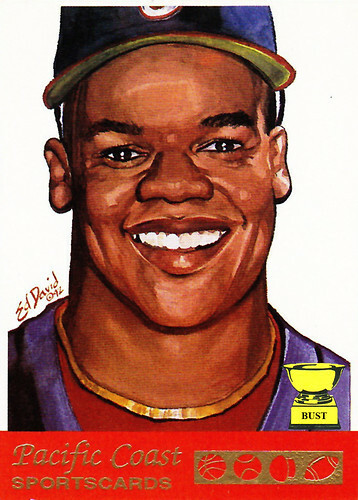 Frank Thomas was a masculine man, but here he looks like his makeup was done for junior prom. Thomas played for the White Sox, and not only is there no mention of the team on the card, but he appears to be wearing a Cubs uniform. You see it? It's right there, underneath the absurd depiction of a grandmother's gold necklace. But let's put away this waste of watercolor for a moment and focus on the brand. Pacific Coast Sportscards, huh? We're pretty sure they made one card, and it featured a player whose team's home was about 2,200 miles from the Pacific Coast. And one last thing: Apparently, Pacific Coast Sportscards seems to represent four sports. In the gold-plated cutout, there's a basketball, a baseball, a football and, um, a mushroom? Well, you'd have to be 'shrooming to think this card was a good idea.